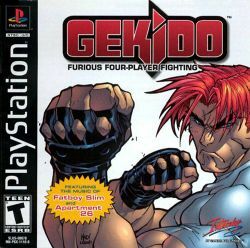 Gekido (known as Gekido: Urban Fighters in Europe) is a beat 'em up for the PlayStation. The game uses a fast paced beat 'em up system, with many bosses and a colorful graphics. The game features the music of Fatboy Slim and Apartment 26. Marvel comic book artist Joe Madureira also contributed. A version of Gekido was also released on the Game Boy Color in Europe. It was later followed by a Game Boy Advance spin-off called Gekido Advance: Kintaro's Revenge. A second sequel has been announced, Gekido: The Dark Angel. In a time where there is great corruption and terror, a young girl named Angela has been kidnapped. Rumor has it that Kintaro has made a deal with the devil. Angela's parents hire Travis, a private detective, to investigate the crime boss Kintaro and retrieve Angela. Knowing that the mission to rescue Angela will not be easy, he is aided by three sidekicks, Michelle, Ushi, and Tetsuo. This page was last edited on 22 February 2017, at 21:14.